If you're looking to buy a cool cabriolet car, a super soft-top, a dazzling drophead or a classy convertible, you may find your current insurer will be looking to make a killing on your new insurance premium. But with Adrian Flux, the specialist insurer for sports cars and convertible cars, you will find premiums don't have to go through the roof just because you can occasionally remove yours. Owning a convertible car and feeling the wind in your hair is a whole new driving experience. You may find getting a convertible car insurance quote from Adrian Flux a rather new experience too. Our brokers are insurance experts and, having been in the business of insuring convertibles for more than 40 years, we have a wide panel of insurers with hundreds of policies to choose from. We are confident we will be able to come up with a deal that is perfect for you and your car, and at a price that won't make your eyes water. At Adrian Flux we know a lot about the kind of people who buy convertibles. We know that people who love their cars as much as you do are going to take extra special care of them and that is reflected in your policy quote, whether you have a hardtop convertible or a soft-top, whether your car is a four-seat convertible, a five-seat convertible or even a two-seater. 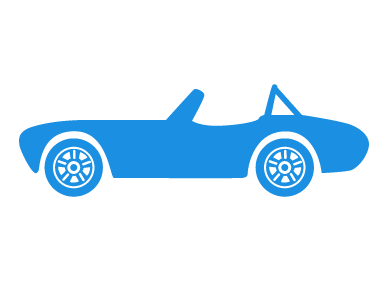 In fact we can offer low-cost, high quality insurance cover to most convertible car owners, including young and convicted drivers. So whether you drive the latest BMW Z4 Roadster, a Mercedes-Benz E Class Cabriolet, a soft-top Porsche 718 Boxter, a drophead Jaguar F Type or a Mini Convertible, we will have a policy at a price that will put a smile on your face. Cover is also available for high performance cars including imports and exotica, left hand drive models and modified cars. Our best and quickest deals are always available over the phone. Call 0800 369 8590 to talk to one of our insurance experts or book a call back at a time that suits you (9am to 7pm Monday to Friday or 9am to 4pm Saturday).